Bath time can be a fun part of baby care, for both of you. Two keys to happy and safe bath times are warmth and hands-free bathing. Warmth applies to the room temperature as well as to the water temperature. The warmth of the room, and the warmth of the water, help your baby to relax and enjoy this new experience. 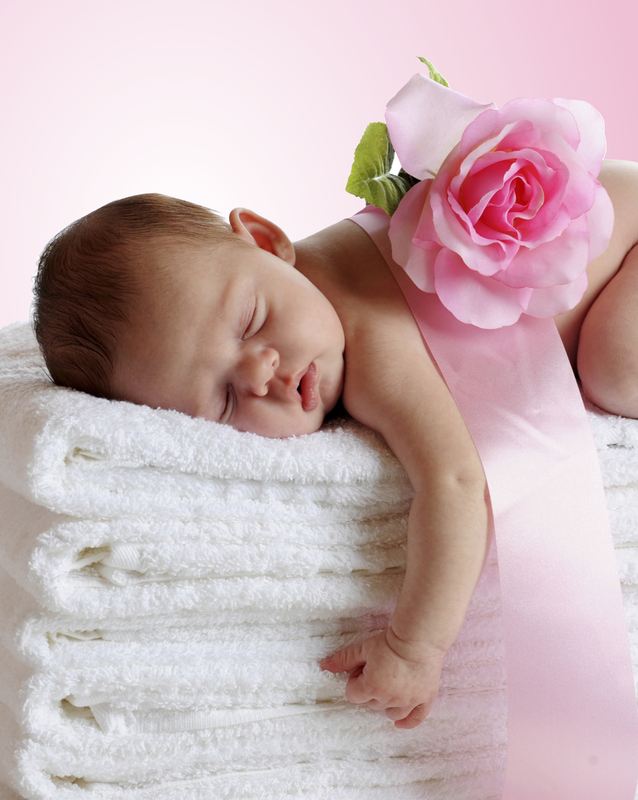 When giving your newborn a sponge bath you may set up a bathing area in any warm room. It might even be the kitchen! Whether sponge bathing or tub bathing, you’ll need two hands free to safely manipulate your baby’s soapy, slippery arms, legs, and body. Safe means your newborn is protected from falling or drowning, without requiring you to hold on to your baby during the bath. This safe bath area allows you to have both hands free to safely wash and rinse your baby. Safe, as you know, also means never leaving your baby unattended during bathing. The newborn in the picture is sleeping on a pallet of towels much too high for safe bathing, but perfect for an adorable picture. For your newborn’s sponge bath, one folded adult bath towel should be sufficient to provide the desired softness and absorption, as well as give you a safe area for hands-free bathing. Keeping bath supplies close to the towel pallet allows you to work easily and quickly, helping to keep your baby warm. Currently the common guideline for when your baby can be placed in water that covers the abdomen, is after your baby’s cord has fallen off and the skin has healed completely. Using a baby bathtub may be a great way to make this transition easily. There are a variety of colorful tubs to choose from, offering a variety of options for your baby’s safety and comfort. “Sponge Bath” Video: You will be able to see a demonstration of safe and hands-free bathing, and a happy newborn Baby Vanessa, in Newborn Baby Manual. This entry was posted on January 29, 2013 by D. Fravert, RN. It was filed under Baby Care Tips and was tagged with baby tub bath, D.Fravert RN, Newborn Baby Manual, newborn care, newborn sponge bath, tips for bathing your newborn.